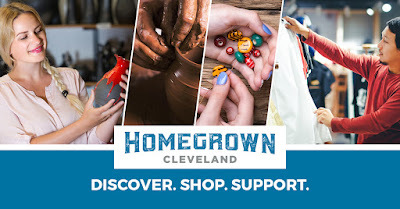 Join me this weekend at Homegrown Cleveland to support local makers and get a really early start on your holiday shopping. The Homegrown marketplace will feature goods sourced from across downtown neighborhoods including apparel, jewelry, ceramics, tableware, poster art and more. Enjoy beer from Great Lakes and wine from ManCan and take a break from shopping and relax in the K&D Lounge. All attendees receive a free Homegrown tote bag designed by Cleveland Clothing Company and two drink tickets. Get your tickets online and use Promo Code "Crystal" for a 50% discount! Getting hygge with it! The Cleveland Candle Co.